Indian football team goes into the AFC Asian Cup as massive underdogs, but a positive result in the tournament opener against Thailand, the lowest ranked team in the group, will be a boost for qualification to the next round. 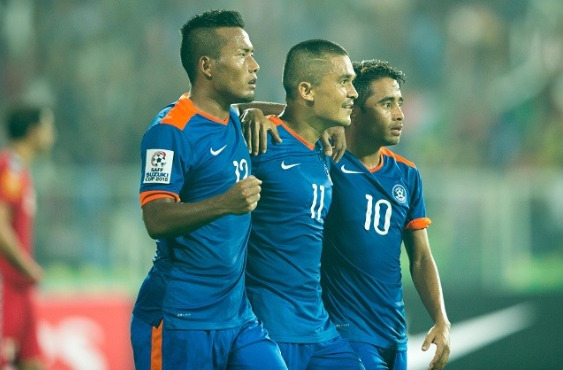 With victory paramount against Thailand in the opening match of the AFC Asian Cup, Indian football team will hope the strike duo of Jeje Lalpekhlua (left) and Sunil Chhetri (centre) come up with the goods (Pic: AIFF). The Indian football team will begin its campaign at the AFC Asian Cup against Thailand at the Al Nahyan Stadium in Abu Dhabi on January 6. Sunil Chhetri and Co, ranked 97 in the world, is the second best ranked team in Group A, behind hosts, the United Arab Emirates (UAE), who are ranked No. 79 on the FIFA list. However, boasting rights based on ranking remain confined to paper. Realistically, the UAE, Bahrain and Thailand are considered stronger sides and India are the pre-tournament underdogs in Group A. All that would obviously change if India manage to start with a win against Thailand, the so called weakest among the three opponents they will face in the preliminary round. With the top two sides set to automatically qualify for the quarter final stage, a win in the opener could put India in the reckoning. Stephen Constantine’s men have shown a lot of grit of late in their latest friendly outings. In October last year, they held China to a 0-0 draw in Suzhou, and narrowly lost the away friendly against Jordan in November (2-1). India also held Oman to a 0-0 draw on December 27, their official build-up game for the AFC Asian Cup. On all three occasions, the Indian defense showed a defensive solidity necessary in big tournaments. The biggest worry for Constantine though will be the lack of goals up front. India need goals and a win at least to stand a chance to progress into the quarters. One would imagine that with Chhetri, Jeje Lalpekhlua and Sumit Passi up front, that wouldn’t be a problem. But the strikers have been a little off colour at the Indian Super League (ISL) as well, and with opponents marking Chhetri tightly, goals have dried up. On the contrary, India’s opponents in Group A are all considered to be teams who are happy going forward. Here is a look at India’s Group A opponents and the fixture. Thailand last featured at the Asian Cup in 2007 as co-hosts. They qualified for the 2019 edition as winners of their group in the second round. However, Milovan Rajevac’s men are coming into the competition in the UAE after a disappointing campaign at the AFF Suzuki Cup where they lost to Malaysia in the semifinals. The coach and players are under pressure to deliver, and Chanathip Songkrasin and Teerasil Dangda -- their key players -- would be looking to take their side into the knockouts. Hosts UAE, coached by former AC Milan and Inter manager Alberto Zaccheroni, are searching for their maiden Asian crown. They are the favourites to progress to the quarters as toppers from Group A but losing star playmaker Omar Abdulrahman to injury means their build-up to the tournament has been far from perfect. The team has also had poor outings in recent friendlies, losing to the likes of Trinidad and Tobago and Venezuela. Much will depend on the form of their key players Ismail Al Hammadi and Khalid Eisa. Bahrain had a long drawn qualifying campaign for the Asian Cup -- managing to make it to the tournament only after the third round of qualification. Since then, they have played a lot of friendlies preparing for the tournament and will come into UAE with perhaps the most well-oiled squad of the lot. Their build-up began with a loss to Syria last year, and draws against China and Philippines.That was followed by win over Myanmar Tajikistan, Lebanon and DPR Korea, a run where they scored 10 goals without conceding a single one. Coached by Miroslav Soukup of the Czech Republic, Bahrain will depend on striker Abdulla Yusuf Helal and midfielder Ali Madan to keep the goals flowing in the tournament.